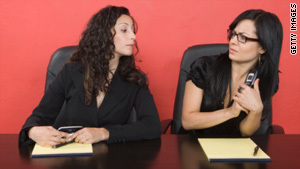 Are you the annoying co-worker? Being too nosey, too negative or too willing to share off-color jokes are ways to be an annoying coworker. (CareerBuilder) -- Think back to the last big gathering you had with family or friends. Maybe it was Thanksgiving dinner and your house was full of people -- some you knew well, others you just met. No matter how great the day ended up being, one person could have easily ruined it. Perhaps one person did. Inevitably you'll hear someone say, "There's one in every family." Guess what? There's one in every workplace, too. Whether you work in a law office on the top floor of a skyscraper or on a beet farm with your cousin, no occupation is immune to an annoying co-worker  the person who has the unparalleled ability to take a pleasant work environment and turn it into an excruciating experience for everyone else. Because we don't want you to be the person everyone (not so) secretly hates, here's a checklist of annoying behavior for your reference. If any of these actions describes you, you should probably try to change your ways -- and make amends with your co-workers, while you're at it. Annoying habit No. 1: You give more advice than a newspaper columnist. Why it's annoying: I'm sure you got a strong B in your Intro to Psychology class in college, but you are not the office sage. If people ask for your advice, feel free to give it. But constantly offering unsolicited advice is basically like telling everyone that they're not living up to your expectations. Annoying habit No. 2: You can't let go of the good ol' days. Why it's annoying: Workplaces change. Blame it on technology, the economy or management. What matters is how easily you adapt to these changes. If you're constantly talking about how you used to do things at your last job or when the old boss was in charge, people will wonder why you stick around. The new boss might even think you're better off working somewhere else and let you go. Annoying habit No. 3: It's not HBO. It's an office. Why it's annoying: Some people forget that controversial topics and colorful language make for great cable TV, but they don't make for appropriate workplace conversation. If you're telling a story that would make Tony Soprano blush, either tone it down or save it for happy hour with only your closest colleagues. Annoying habit No. 4: You always rely on the kindness of strangers -- and co-workers and administrative assistants and the mail clerk. Why it's annoying: Important people with fancy titles are often helpless when it comes to faxing documents or working the copy machine. They have assistants for that. You probably don't have an assistant, and that means you are responsible for taking care of everyday tasks like putting more paper in the copier or setting up a conference call. You're bound to have questions the first few times you do it, but you're just being lazy if you refuse to learn how to do these things on your own. Annoying habit No. 5: You have an even better story. You always have a better story. Why it's annoying: Isn't it fun when co-workers share? It's a fun way to bond. Until the one person has to take center stage and tell the ultimate story that shows up everyone else's story. Even if your stories are better, don't feel the need to share them all the time. You look petty and people have stopped listening long ago. Annoying habit No. 6: You smell like a walking bag of potpourri. Why it's annoying: On behalf of everyone who has ever worked next to a co-worker who smells like he just ran a marathon, we thank you for trying not to smell bad. Too much cologne or perfume, however, can be just as bad. It singes our nose hairs, makes our eyes water and distracts us just the same. Plus, allergy sufferers will probably get a headache the moment you walk through the doors. Annoying habit No. 7: The subject line of an e-mail is the entire message. Why it's annoying: Putting all the content of an e-mail in the subject line and having nothing in the body is annoying because the recipient probably has to keep scrolling to the right just to see what you're trying to say. Plus, most people glance at the subject and then expect to get the meat of the e-mail in the body. If there's nothing there it's just confusing. Annoying habit No. 8: "K"
Why it's annoying: If your entire response to someone's e-mail is "k," then you probably didn't need to respond at all. And you definitely didn't need to copy everyone on it. You should have at least taken the time to type a few extra letters so it reads "Thanks for letting me know." People are taking the time to read your message, so make it worth their while. Annoying habit No. 9: You can't wait until the day is over. Every day. Why it's annoying: At one time or another, people are fed up and want to go home. Co-workers bond over the mutual desire to leave as soon as the clock strikes quitting time. Nevertheless, don't broadcast your disgust with work every chance you get. Negativity gets on people's nerves and calls your work ethic into question. Annoying habit No. 10: You heard someone got a really good parking space, so you decide to throw a party. Why it's annoying: Office parties can be nice breaks to an otherwise mundane day. When the days with parties outnumber the days without parties, people are already annoyed. First off, it's not really a party when you're just eating grocery store cake in a beige conference room or the room in the back of the store where everyone leaves their coats while they're working. Second, these gatherings get to be disruptive to schedules when they happen too often, but then people are afraid to skip them because it can start drama. Keep the celebrations to a reasonable number so they retain their fun.